You can find the first part of this delicious evening here. I’m honored to count Emily Asher as a friend and musical colleague, and I was thrilled to be at her swinging concert at Joe’s Pub on June 7, 2015. 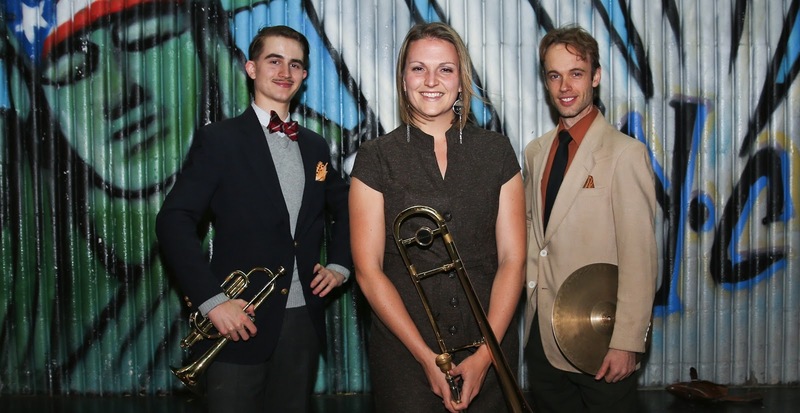 To the uninitiated, Emily’s band — Garden Party — might seem just another retro-swing outfit, offering variations on familiar music. That would be a deep misconception, because as the videos below will show, Emily and her musical pals have musical integrity — that is, they play honest music from their hearts — and expansive visions — so that any gig she’s on is going to be wide-ranging, each selection both improvised on the spot and well-thought out. This is not a band devoted to copying the predictable, but its innovations don’t jostle or hurt. Here is the second part of that very gratifying night at Joe’s Pub. Emily is our trusted trombonist, singer, composer, arranger; with her are Mike Davis, trumpet, vocal; Evan Arntzen, clarinet, alto sax; Dalton Ridenhour, piano; Nick Russo, guitar, banjo; Rob Adkins, string bass; Jay Lepley, drums, vocal. Now that you’ve heard and seen this band in their 2015 selves, please consider. This isn’t a repertory orchestra, tied to the old records; this isn’t a band with a stylistic set of restrictions (“We don’t play anything that the Golden Leaf Mendicants wouldn’t have played on American Music Records”). What distinguishes this band is a delicious freedom for everyone to follow those evanescent yet memorable impulses . . . so there are tinges of gospel, country, “Dixieland,” Forties rhythm and blues, soul, “modern jazz,” and more — no one’s hemmed in and there is a wonderful energetic lyricism permeating every aspect of every performance. Someone should take notice. A residency for the Garden Party, anyone? Perhaps when you think of a party you envision fascinating forbidden foods — in small or large portions — and many cheerful people mingling. That’s not a bad image at all. When I went to Google Images to find something suitable for this blog, most of the photographs were of athletic-looking women in brightly-colored swimwear, arms extended on high. Nice, but I don’t remember being invited to those parties, so I chose something more appropriate. Here are the first six selections from that very gratifying night at Joe’s Pub. Emily is our trusted trombonist, singer, composer, arranger; with her are Mike Davis, trumpet, vocal; Evan Arntzen, clarinet, alto sax; Dalton Ridenhour, piano; Nick Russo, guitar, banjo; Rob Adkins, string bass; Jay Lepley, drums, vocal. A swell party, indeed — full of musical energy, much more sustaining than bacon-wrapped shrimp and mojitos. And there are more performances to come. 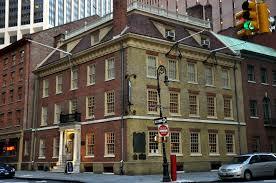 Fraunces Tavern is justly famous (it’s at 54 Pearl St, New York, and the phone is 212 968-1776) but I had never visited. Even though I view Wikipedia with suspicion, this seems both detailed and accurate. But I wasn’t visiting there this past Saturday afternoon to see where George and company bid each other farewell over dinner. I confess that my idea of history is being in Louis and Lucille Armstrong’s turquoise kitchen in their house in Corona. I was there because the trombonist / singer / composer Emily Asher has had a regular jazz brunch on Saturdays (1-4) and I had heard very good things about it, so I made my way down there to enjoy Emily, guitarist James Chirillo, string bassist / singer Sean Cronin, and a special guest. I approached the first two sets as a civilian, drinking coffee (brought to me by a very sweet young waitperson), watching the ebb and flow of families, and digging the music. Before I talk about the music, though, a digression. I have a notebook when I go to any music, to write down information — song titles and the like — because I can’t always rely on my memory when I get home. And I am a born eavesdropper and collector of things sweet and strange. While Emily’s Garden Party trio was playing, a large group of children was dancing in the adjacent room. They were too young to know the Balboa, but they were having a fine time. A man in his twenties looked at the band and said happily to his companion, “Oh, a little trombone action!” which was a good critical soundbite. To my left sat a grandfatherly-looking man with what might have been a captain’s hat, surrounded by four or five pre-teenagers who might have not been his blood relations. They were having a fine time, and he was talking with them about different subjects and eliciting their responses (as opposed to a monologue). One subject was flags of the world, which I confess did not catch my attention. But the subject that did was his grass-roots explanation of economics, which caught me because it had the enticing word CUPCAKES prominently featured. Compressed, his explanation went something like this. “Everyone here likes cupcakes, and you can bake some and sell them for money and you hope to make a profit, and if they’re good cupcakes, then people are happy. If you have a library, you don’t make any money, but the people who read the books get smarter and the whole society improves.” I’m not sure that any of his acolytes were willing to give up the idea of cupcakes, but he was a sly and I hope effective economist. Back to the music. It was tender, then it swung like mad. STARS FELL ON ALABAMA, I’M COMIN’ VIRGINIA, and LOOK FOR THE SILVER LINING were dear and sweet. Emily sang most fetchingly on VIRGINIA and SILVER; there was also heat on SOMEBODY STOLE MY GAL, SOME OF THESE DAYS, and a half-dozen others. James Chirillo, the prince of swing, created a surrealistic masterpiece of a solo on THERE’LL BE SOME CHANGES MADE that would have pleased Stuart Davis or Magritte; Sean Cronin swung both with and without the bow, slapped the bass in the best Al Morgan manner, and harmonized with Emily on WHEN YOU WORE A TULIP. And — something new – – Emily picked up an empty coffee cup and used it in the best Vic Dickenson manner to make new sounds. I was very pleased to see this manifestation of Vickensonian ardor. George Washington never slept here: he would have been too busy putting ancient money in the tip jar. Or he would have been looking to see if there were any cupcakes on the menu or if they were simply theoretical ones.